Good news for the Donald LeBuhns of the world, newly uncovered patents filed by Apple show the company has been thinking about upping durability for portables. Future iOS devices may even be getting little airbags installed to prevent your precious mobile electronics from shattering on the first drop. The patent was apparently filed in 2010′s Q2, and dug up by Pattently Apple who says that one of the patent inventors, Stephen Lynch, worked on the iPod touch and inductive charging projects. One pathway the patent points to for enhancing the durability of devices—assuming scratch attracting plastic isn’t considered—is to strengthen the glass. The thinner the device becomes, the thinner the glass cover window which can mean impact will crack or shatter it more readily. Alumino silicate, known as Gorilla Glass, is suggested, but future options to resist thermal shock include sodalime and borosilicate. The main focus in the patent seems to be concerned with types of “apparatus, systems and methods for shock mounting a cover glass for an electronic device.” One method involves cover glass and a shock mount—which is an elastic fastener—that buffers between the glass and the rest of the electronic mass. Another method discussed in the patent involves glass, shock mount and sensors which can sense a drop and retract and protect the cover glass. There is also a tunable shock mount option which would create “compression and dampening, so as to isolate the cover glass from the remaining mass of the electronic device.” The tunable option could have a shock mount made of polymyer, gel, foam, shape memory material, silicone rubber, viscoelastic material and other suitable types. The shock mount could also be made of an inflatable rubber bladder, or one filled with fluid that expands in shock events, e.g. an air-bag. Of course, just because it’s a patent doesn’t necessarily mean it’ll be implemented, but its nice to see some of the ideas being juggled by the Apple think tank. 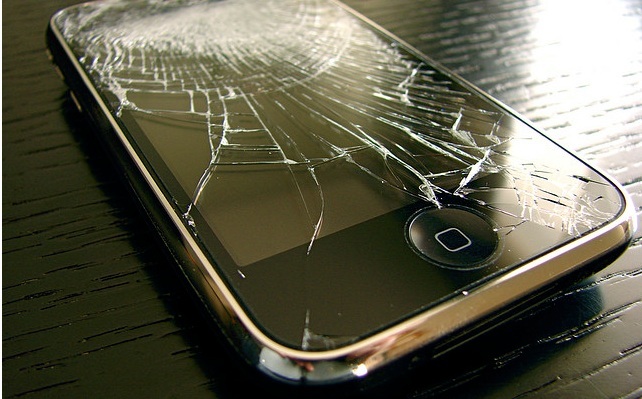 Future portable Apple Inc. devices such as the iPhone and iPod Touch may soon be crack-resistant, after the tech giant filed a patent for a crack-resistant glass solution for its devices. The new solution involves a tunable specialized shock mount that sits between the glass and the body of the device that could be instantly inflated if the device senses a drop, Patently Apple said. 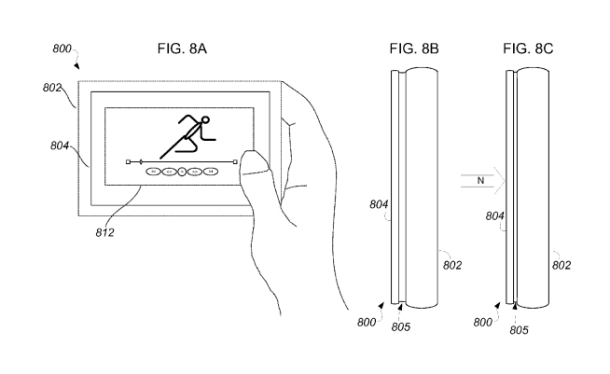 "Apple's patent describes using exotic materials that could protect the glass from shattering. As a side bonus, Apple is also considering a solution that could provide portable devices with a new water damage prevention seal," it said. Such a solution seeks to protect the relatively thin glass in a small form-factor device, Patently Apple said. But it also noted the solution could also apply to larger devices like the iMac, Cinema Display, iPad, and MacBook and televisions. One implementation of the solution would be to have a controller and actuator withdraw the cover glass at least partially into the housing if a drop is sensed. Under the patent, electronics within a housing of a device could be protected from water damage with a water seal. Patently Apple said the patent allows for an electronic device to have a cover glass with a tunable shock mount between the cover glass and the housing. The cover glass could be suitably arranged with the tunable shock mount, which could be tuned to limit susceptibility to damage. The tunable shock mount may provide compression and dampening, "so as to isolate the cover glass from the remaining mass of the electronic device." Patently Apple said the tunable shock mount may be made of a polymer, a foam, a gel, a viscoelastic material, a shape memory material, an exothermic material, an optically transparent material, a silicone rubber material or other suitable material. Also, the tunable shock mount could be tuned to have a resonant frequency that is substantially lower than the resonant frequencies of the cover glass and the remaining mass of the electronic device, and tuned "so as to be substantially critically damped." On the other hand, Patently Apple said the tunable shock mount may use a micro inflatable bladder, like a form of air bag. "Think of it as a form of air-bag for portable devices," it said. Patently Apple said one aspect of this invention has already been put into place on iOS devices: using alumino silicate glass (Gorilla Glass). But the patent also defines other glass materials that could be used in the future, including sodalime and borosilicate that may make the glass resistant to thermal shock. "Moreover, the cover glass pieces can be chemically treated for further strengthening. One suitable chemical treatment is to place the cover glass pieces in a chemical bath containing potassium (e.g., KNO.sub.3) for a period of time (e.g., several hours) at an elevated temperature. The chemical treatment could desirably result in higher compression stresses at the surface of the cover glass pieces," it said. It added the surface of the cover glass pieces includes the edges of the cover glass pieces. A separate article on CNET said the idea "bears similarity" to an Amazon patent filing in August that detailed an airbag system for mobile devices that blows up just like airbags in a car.